About the Shop - Village Blacksmith, Inc. Village Blacksmith Inc. is the forge and shop facility of artist-blacksmith Ken Roby. 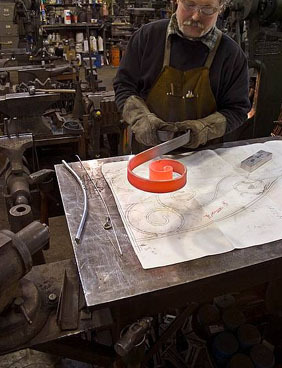 Widely recognized for hand-forged ironwork, Ken’s shop is a well-equipped and versatile blacksmith shop offering a wide variety of custom metalwork. Village Blacksmith Inc. is known for its gates, railings, and balconies. Custom furniture, hardware, fireplace screens, lamps and a wide variety of miscellaneous and restorative works. Blacksmith Ken Roby and his assistants want to preserve the art of the blacksmith, so most pieces are made by hand, signed and dated. Most work is produced using both traditional methods of blacksmithing and joinery as well as more modern techniques. The most important tool that Ken employs is his creative problem-solving skills. If they say it can’t be done, ask Ken! While most work is decorative, sculptural, and architectural ironwork, Village Blacksmith Inc. also provides a variety of general welding, fabricating and repair services. Because of the versatility of the blacksmith shop, Village Blacksmith is well suited to many unusual projects with repairs and fabrications ranging from jewelry to bulldozers to airplanes. This type of work often includes restoration of existing ironwork and antiques. Since Ken’s work does not rely on pre-manufactured ornamental iron components, you are really only limited by your imagination when it comes to designing your project (Well yes, there are building codes and budgets, and there is always the basic law of gravity). Often a design or general idea may be presented by an architect or designer, but most commonly people will have an idea from a magazine or picture, or will get an idea from our portfolio. A sketch on the back of a napkin can suffice. This is your ironwork, so Ken will work personally with you to create the best solution. No one knows better than you what you like.